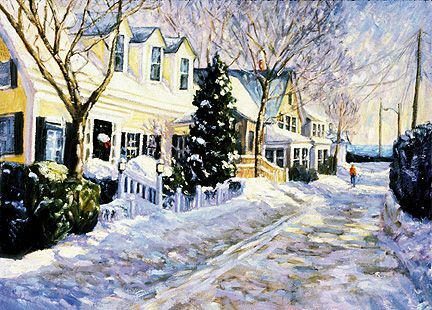 Liz Aberdale's love of New England and its natural beauty are evident in her light-filled paintings. She paints on location (also known as "en plein air") nearly all year round and wherever she travels. "December Morn" captures the energy and soft shapes enhanced by the sunlight, early in the day, after the storm. Liz lives on Cape Cod and is part owner of Chatham Art Gallery, Chatham, MA. She is a full-time artist, and travels extensively with her husband to expand her on-location subject matter.